We often don’t take time to look at or think about how confident we are in our life, our life challenges and the world. Our confidence is rooted in many aspects of our lives. Some of these aspects include how we feel physically, how we look and how aligned our life is with a greater meaning or purpose. Our health The quality of our health directly relates to the energy we have on a daily basis and how we feel over all. Our physical appearance, posture and how show up in the world dictates how we are perceived and received. It is also a direct reflection, in many cases, as to how we feel about ourselves. The greater meaning and purpose that our life holds is also a key factor in building strong confidence – as when we have meaning in our lives our days become brighter, more alive and richer in all ways. Confidence as we can see is built from many different aspects of our life. I have recently reignited a yoga practice and have noticed how my posture has improved. And, how when walking into a room I feel stronger, more upright and more confident. I also have been noticing the foods I put into my body and how specifically I feel after eating different foods. There is something very consistent about the buzz of sugar and the immediate bliss I receive but an hour later I can consistently count on a physiological dip. If you meet me during this dip and after not having stretched or loosened up the tightness in my body for some time you would be meeting a less confident woman who carries herself differently In the world. Trust me I have tested this correlation time and time again. I have come to realize that we can’t express next level of confidence without looking at our bodies, our minds and our spirit. I recently heard Deepak Chopra give a talk on body mind medicine to about 2500 people in California. Not only are we interrelated on the global front through, commerce, our monetary system, the way that germs and epidemics travel but we are also interconnected within our own being. A truly confident woman gains strength from a fully respected, fully charged body from a mind that is clear and rested and a soul that is deeply expressed, in the way that she shows up contributes and lives in this world. This month in the Essential Feminine Living Room we will be discussing next level confidence. We will look at the many components that go into a confident well-lived life. When you line up the different areas we will be looking at and incorporate them into your life you will have the opportunity to take your confidence to a whole new level. Check our blog each week as we will be adding more food for thought. Today, take a look at your life and decide of the areas we have covered, which ones you need to view more closely to gain far more confidence in your life. Join us on June 22 from noon to 1:15 p.m. PDST for our next Living Room. Register now to save your seat. http://theessentialfeminine.com/shop#living. As usual there will be an opportunity for conversation and networking. Share the word. As we move into the autumn and winter months, for many of us, it becomes easier to reflect on our lives. The darker days with rain and snow inevitably slow us down. Use this time to contemplate where your confidence level is today in the different areas of your life; work, partnership, health, new acquaintances, and with new possibilities and risks. You will probably notice differences in these areas. Notice also the state of your well-being in each of these areas. Is there a direct correlation between well-being and confidence? 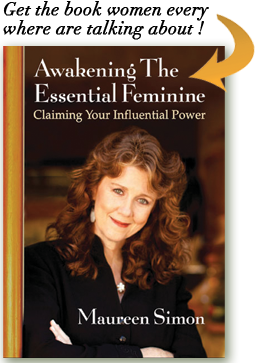 In The Essential Feminine™ Living Room, on October 27th at noon PST, we will be looking closely at how our energy, biorhythms, the meaning of our lives and our overall physical and mental health totally inform our confidence. We will look at ways to raise our vibrations and discover how your choices relate to the life you live daily. It is important to realize that a truly confident woman gains her strength from truly respecting her body, from a clear and rested mind and from a deeply expressed soul. I’ve come to know that we are part of a much greater picture than we might believe when we sit stuck in a traffic jam or feel frustrated about a challenging communication in our day. These days I have been learning to take an aerial view and fly high above the simple challenges that take place in my day-to-day life. I have come to believe that each of our lives may sometimes feel ineffectual, but in reality something very major is happening. The real art is to learn how to tune in to what is most important in our life? How do we identify what our true passion is so that we can begin to move from ineffectual to fully alive and passionate. I believe the answer to us finding our passion-lies in our ability to connect with what is deep in our life – what is significant and important to us. I believe that we have deep wells of joy that are waiting to erupt as a geyser or a spring. We must take time to listen and to allow the answers and information that we need to find us. Silence is a natural way to connect with what we hold deep in our hearts. Trust that through silence signs that come into your daily life – trust and your ability to follow what feels good and right in your life will all serve as great resources on your journey to connecting with the bigger eternal aspects of your life. 1.Take yourself seriously. Take an inventory of your assets and strengths, claim them, share them, and live proudly with them. 2. Surround yourself with great mentors and teachers that can allow you to both grow and learn. Notice the ways that you are most inspired, notice the times that you feel most in need of greater knowledge. 3. Read, ask questions and read. Stay current on topics that interest you most, notice trends break downs, and areas where you can make a contribution. 4. Do more of what you love. Surround yourself with work and play that is both satisfying and enriching. Use your heart, soul, and voice in equal measure. 5. Go within and listen for what is right to you. Integrate these things ideas and feelings follow them, speak about them.